I didn’t know who Joe Hill was when I bought Heart-Shaped Box. I read a review, thought it sounded interesting and bought it. The book sat on my to-read shelf for several months (yes, my to-read shelf is ridiculous!) until I had a conversation one day in the bookstore. Customer: I’m looking for 20th Century Ghosts by Joe Hill. You probably don’t even have him. Me: He wrote Heart-Shaped Box. Customer: (looking surprised) Yeah. Have you read it? Me: (sheepishly) No. But I’m going to. Customer: He’s Stephen King’s son. Me: (my turn to be surprised) Really? Wow. Customer: I *loved* Heart-Shaped Box. It’s fantastic. And now, just this morning, after my kids left for school and my husband left for work and before I had breakfast or started any of the things I have to do before I go to work…I finished the book. Ironically, the last time I carted a ‘horror’ novel around with me it was King’s book It. That was a long time ago. I loved that book. Me: Do you like scary stories? Me: Have you heard of Joe Hill? 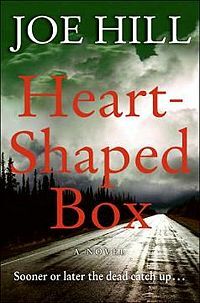 Me: I am currently reading Heart-Shaped Box. It’s great. (hand her a copy). He’s Stephen King’s son. I hope Mr. Hill doesn’t think it’s a disservice to draw a comparison between him and his famous Dad. I grew up reading Stephen King. I don’t like everything he’s ever written. For example, even after several attempts I cannot get into The Stand and I know people who love that book. But the thing about King is that he writes books peopled with characters whose fate you actually care about. If you didn’t give a toss about them- the horrible things that happen to them wouldn’t matter. They’d have it coming. Any ambivalence I felt about Jude’s fate ended right then and there. Suddenly, he was a character- fully drawn, with an aching past and a boulder the size of Mount Rushmore lodged in his heart. Hill doesn’t go over-the-top with details of Jude’s horrific childhood; I didn’t need to hear anymore anyway. Your imagination always fills in the blanks. Besides, Heart-Shaped Box operates on a more immediate level. The book has barely begun before Jude buys a dead man’s suit and the ghost that accompanies it. Then all hell breaks loose and Jude and his goth-girlfriend-of-the-moment are running for their lives. And, thanks to Hill, they are lives we actually care about. Of course there are some horror conventions in this book: radios that intone doom, television news reports that announce horrible endings, creepy people with scribbled out eyes. There are no cliches here, though. Mr. King must be tremendously proud. This entry was posted in Uncategorized and tagged 2008, Book Review, highly recommended, horror, literary fiction by Christie. Bookmark the permalink.